German Canadian Klaus Ferlow was one of the first to introduce the miraculous healing products from the Indian Neem tree to the West. As a teenager he'd developed a stubborn case of psoriasis which was resistant to both conventional and alternative treatments. His life changed 40 years later when he found out about the remarkable healing properties of Neem, a plant that healers in India have used for thousands of years. Within a few weeks Neem had finally freed him of the life-long condition. As a manufacturer of botanicals, Klaus was in the ideal position to develop a variety of Neem products and make them available to the North American market, as early as 1994. The author traces his own healing journey and his lifelong fascination with the versatile Neem tree from Canada to the Indian subcontinent where the tree originated. The book includes a valuable guide to herbs, list many useful healing applications of Neem, and explores its politics and history. The endearing story of the Neem tree is told through the eyes of one of its most enthusiastic advocates. Klaus Ferlow has since established the Neem Research organization to protect and promote this precious healing gift to humanity. Klaus Ferlow, HMH, HA, is a Master Herbalist and manufacturer of botanical health and personal care products. He founded Ferlow Brothers Ltd. in 1975, and the name was later changed to Ferlow Botanicals. In 1993, he manufactured a wide variety of 'zero harm' herbal products, and the following year he offered herbal Neem products to holistic practitioners in Canada and USA. After Klaus's retirement in 2013. His son Peter runs the company today. In 2013, Klaus founded Neem Research, dedicated to the promotion and preservation of the Neem tree. 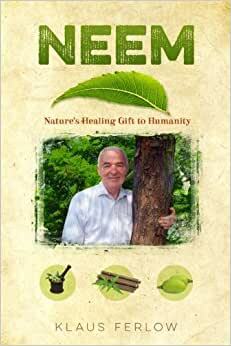 Klaus Ferlow's book 'Neem - Nature's Healing Gift to Humanity' is the result of a intelligent person's life journey of healing by being open to handed-down practice of using what nature provides us; namely by using herbs and plants to strengthen health . As often is the case to new learning, personal health challenges lead those dedicated enough, to discover solutions which God provided us in the form of natural herbs and plants. This well written story is a peek into Mr. Ferlow's research of one particular plant substance which he discovered out of a need to overcome a personal health challenge; Psoriasis. This book is a fast and interesting read on the many attributes of the Neem tree and its many heath benefits for the skin and other uses such as agriculture. It is chock full of useful references to Neem sources and organizations. I recommend this book to all who are interested in growing their knowledge of using God's medicine-chest of herbs and plants...Neem Oil is one substance you should include in your personal use or practice. This book is a great testimony to the glory of Neem, a priceless tree. Klaus shares his research and insights powerfully for the benefit of humanity in his book. Well Done!! -Ravi Sahay, author, "My Health is Your Wealth"
Well researched and comprehensive. This book covers all the important uses of this highly versatile tree. The resource section (nearly 100 pages) is a gold mine for people who want to dig deeper into the subject. If you're interested in the Neem tree, this is definitely a book to get.